The Arabs, devoted coffee drinkers, called kola “the coffee of Sudan.” This was true in several ways. Like coffee and tea, kola delivered a caffeine kick and was used partly as a pick-me-up. Laborers chewed kola to overcome fatigue and to blunt hunger and discomfort, in the same way that Andean peoples chew coca leaves. (In the late 19th century, an American combined carbonated sugar-water with extracts from coca leaves and kola nuts: Coca-Cola.) Kola also had some of the same social functions as coffee. 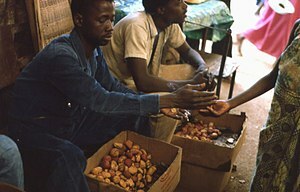 Just as Turks and Arabs immediately served guests a cup of java, West Africans traditionally offered guests a kola nut. Kola nuts were essential at naming ceremonies, weddings, and funerals. People swore oaths, cemented business deals, and pledged daughters in marriage by breaking kola together. On important holidays, rich people distributed kola nuts to the poor as alms. In Chinua Achebe’s germinal novels, Things Fall Apart and No Longer at Ease, the ritual sharing of kola nuts signifies traditional values, a ritual threatened by new historical forces. Kola differed from coffee in another way: cost. Though considered indispensible by rich and poor, kola was also a luxury. In Barth’s day, one nut cost as much as many cups of coffee. To get the nuts, Kano’s traders traveled west for several hundred miles to a small town called Selga in what is now Burkina Faso. There they haggled with Ashantis, the main suppliers of kola, who had come from the forests of Ghana. If the Kano traders didn’t bring enough asses, or if some of theirs had died en route, Mossi livestock dealers stood by to sell them replacements at three times the Kano price. Selga was a miserable place with little water, so water merchants hawked their product at exorbitant prices. The Kano traders didn’t linger in Selga. On the way home, they paid levies to every chief along the route. By the time Barth arrived, this commerce between forest and savannah had been going on for at least six centuries. The German explorer Gustav Nachtigal, who reached Bornu 20 years after Barth, described the careful measures required to transport kola nuts from the source to market. The trip took several months, and unless the trader was careful, his stock would spoil. Kola is finicky, requiring the right amounts of moisture and coolness—not easy to maintain in central Africa. The traders packed the nuts in baskets lined and topped with thick layers of damp leaves. During the rainy season the traders unloaded the baskets twice a month, spread them on the ground to air out, discarded any that were spoiling or worm-eaten, then sprinkled the rest with water and repacked the baskets. In the dry season they followed this procedure twice a week. One song from Bornu lamented that one of the worst things about being captured as a slave and sent to the Barbary Coast was the scarcity of kola there. In fact the nuts were exported to northern Africa and fetched high prices, noted Nachtigal, but they usually arrived in such a dry wrinkled state that only the poorest people in Bornu would have deigned to chew such sorry specimens. So for Nasiru, choosing his father’s kola nuts was a major responsibility. He learned how to judge them. The nuts needed to be smooth, plump, and uniformly colored. Too many brown spots suggested spoilage. Shriveled casings meant tough, dry kernels. Before we left Maiduguri he bought some on the street and passed them around. About the size of walnuts, they were dusty maroon in color. He and Nasiru Wada expertly cracked theirs open at the seam, revealing kernels that were a lovely deep pink. They offered me one. When I bit into it, my face involuntarily puckered at the bitter astringency. They burst into laughter, then resumed chewing. “These are excellent kolas,” said Nasiru Datti. This entry was posted in Uncategorized and tagged Ashanti, Bornu, Chinua Achebe, exploration, Gustav Nachtigal, Heinrich Barth, Hugh Clapperton, Kano, kola nuts, Mossi by Steve Kemper. Bookmark the permalink.